REDDING, Calif. - Story Time with Simpson University, a volunteer effort in coordination with the Shasta Early Literacy Partnership and Mt. 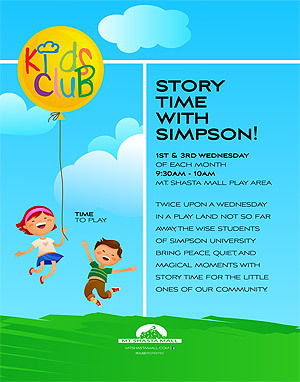 Shasta Mall Kids Club, will return to the mall with new times and more events. Simpson University faculty, staff, and School of Education students will read to young children at the indoor play area near Sears from 9:30 to 10 a.m. on the first and third Wednesdays of each month, starting May 6. Simpson University, established in 1921, is celebrating its 25th year in Redding. An accredited four-year university, Simpson offers 25 liberal arts and professional studies degrees, an adult degree-completion program, graduate studies and teaching credential programs, serving more than 1,200 students each year.